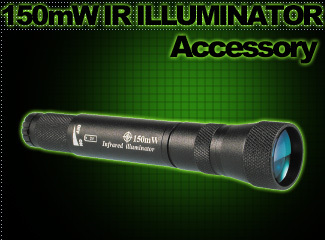 Optional 150mW high power IR illuminator for Tracker™, Lightning™, Tornado™ and Tempest™ series plus the 1505 Sabre Pro™ and 2505 Scimitar Pro™. Variable beam with 3 output settings - c. 805nm output. Gives a total darkness capability up to approximately 200m with Gen 1+ devices and 280m with Gen 2 units. The 100mm f1.5 offers a 10° FOV. 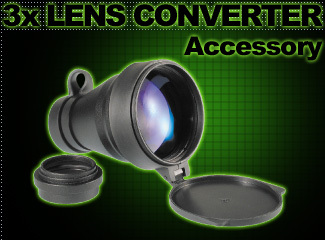 An optional high quality, multicoated 3x Lens Converter that fits on to the 26mm/1.0x mag standard lens of the Lightning™, Tornado™ and Tempest™ series night vision devices. The unit is supplied with an adaptor that allows a quick mount to the front of the 26mm lens allowing you to hold it there for a quick view. 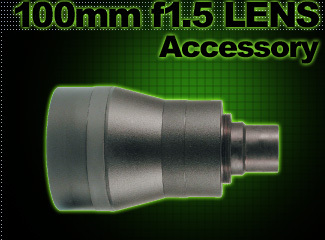 If you remove the adaptor, the unit will screw in to the front of the lens for longer observation periods. Either method will maintain integrity of the device - not having to remove the standard lens means there is no chance of anything ingressing the bodyshell. 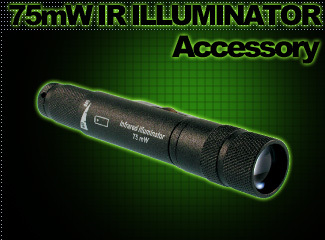 Optional accessory for the Lightning™ series NV monocular - converts the unit to a monocular goggle. Offers flip and lock, ball & socket tilt, eye-relief adjustment and replaceable leather forehead/head pads.